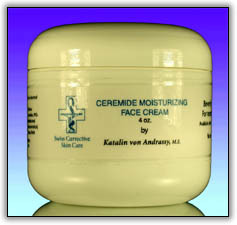 This highly enriched face cream is designed to moisturize, hydrate and nourish all skin types. Leaves skin incredibly smooth and wrinkle free. Apply a thin layer of product on cleansed skin and massage gently for better absorption. Deionized Water, Aloe Vera(Whole leaf), Safflower Oil, Sorbitan Esters, Glyceryl Stearate PEG-100 Stearate, Ceramides, PPG-2Myristyl Ether Propionatek Glycerin, Propylene Glycol, Octyldodecanol, Lecithin, Arachidyl Propionatek Arachidonic Acid, Tocopherol, Linolenic Acid, Retinyl Palmitate, Oleth-2, Carbomer 940, TEA, Diazolidinyl Urea, Methylparaben, Propylparaben, DMDM Hydantoin.